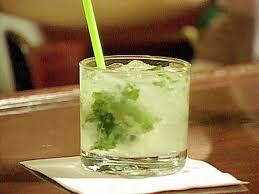 A nice mojito recipe to try ! 1. Place mint and lime slices in tall glass. Muddle gently with muddler or wooden spoon. Though muddling is necessary to release the essential oils of the fruit, it is not necessary to tear the mint leaves. 2. Add sugar, ice, rum, and enough soda water to nearly fill the glass. 3. Shake to mix and serve in a cocktail glass. 4. Garnish with an extra lime slice and sprig of mint. Find a sunny lounge chair and enjoy!